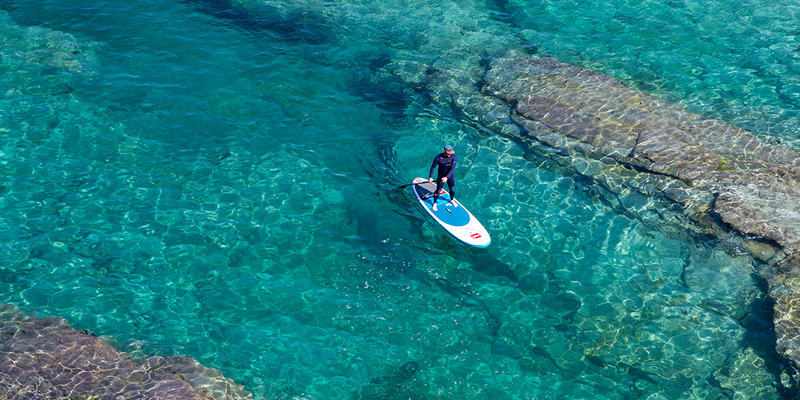 Stand-up paddleboarding is reported to be the world’s fastest growing watersport, and with good reason. It’s great fun and learning the basics is relatively easy, with the option to continue to challenge yourself as you develop your skills. It’s also a great way to get out on the water. 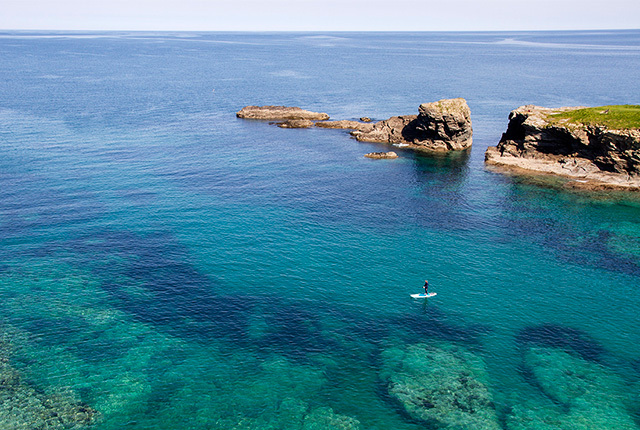 Join a lesson or head out on one of our guided stand-up paddleboard (SUP) tours around Port Gaverne, enjoying a unique view of this beautiful stretch of coastline. We provide full instruction (catering for complete beginners through to seasoned paddlers) and visit otherwise inaccessible locations as we share this unspoiled environment with you. 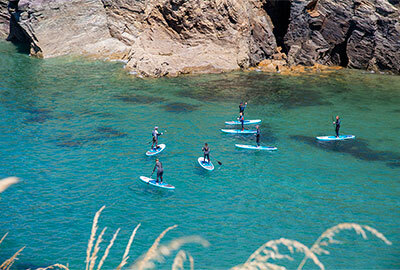 Our stand-up paddleboard lessons offer a great introduction to this enormously popular and very accessible activity, allowing you to learn the basics on calm and shallow water in the shelter of Port Gaverne before we take you on a guided paddle around the cove to put your new skills into practice. 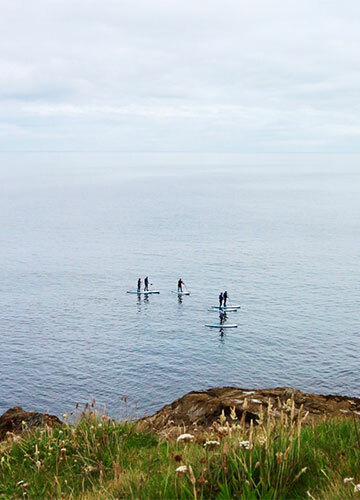 If this is your first time having a go at stand-up paddling you’ll develop the skills and confidence to explore the coastline with us and venture beyond shin-deep water. We use state of the art 10’8” inflatable SUPs from leading British brand RED, and they are incredibly stable and easy to use. Absolutely no previous paddling experience is required, as your instructor will introduce you to the board and all of the basic paddle-strokes that you will need to get you on your way. Sessions last for around two and a half hours, two hours of which is spent on the water. Participants must be eight years old or over and competent swimmers (i.e. be able to swim 25M in a pool unaided), although we can accommodate younger children if accompanied by a parent and subject to conditions and availability. We ask that children under 14 years old are accompanied by an adult. 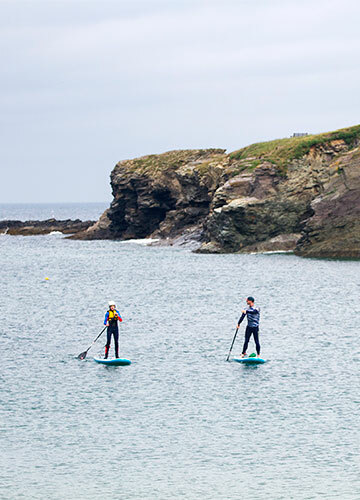 Stand-up paddleboarding costs £40 per person and includes the use of all equipment, including a warm wetsuit and a buoyancy aid. All you need to bring is a towel and swimwear. 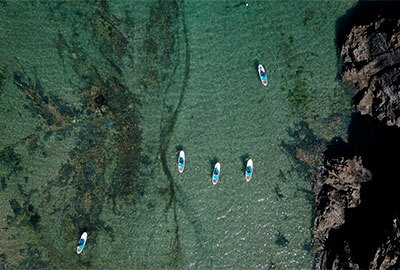 Cornish Rock Tors’ SUP instructors are all fully qualified UKCC instructors with a great deal of experience. They have also undergone our in house training to ensure you are in the safest hands. 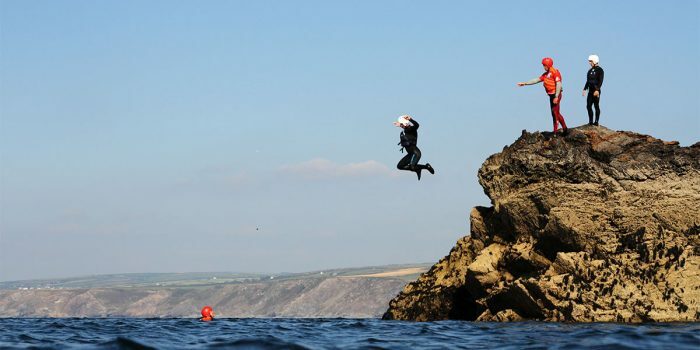 Cornish Rock Tors is licensed by the Adventure Activities Licensing Service and adhere to all of their safety guidelines. 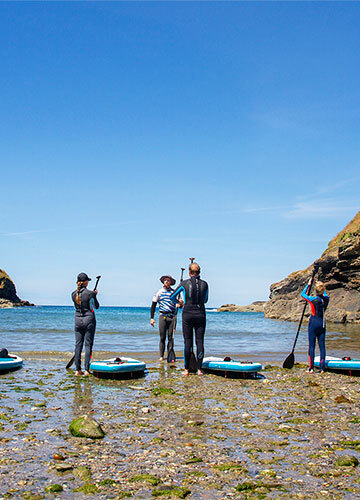 If your stand-up paddling experience so far has been limited to rivers or lakes, then our guided trips will allow you to paddle further, explore more, and develop your skills in confidence, all whilst enjoying a beautiful coastal environment. 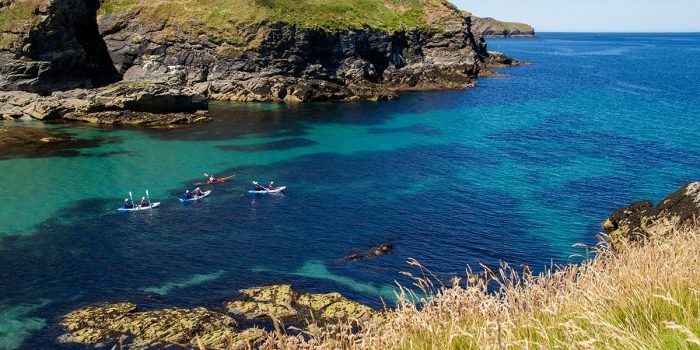 This stretch of coastline is an Area of Outstanding Natural Beauty, and (depending upon conditions) there is the option of paddling the short distance around to the picturesque fishing village of Port Isaac. 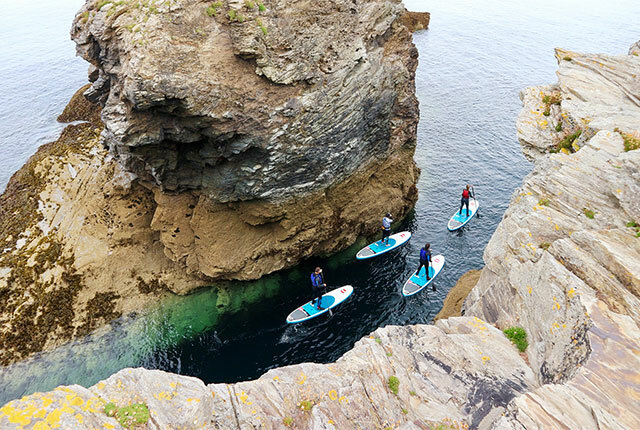 We’ll paddle beneath high cliffs, explore rocky gullies and coves, and can even paddle into some of the large sea caves in the area. 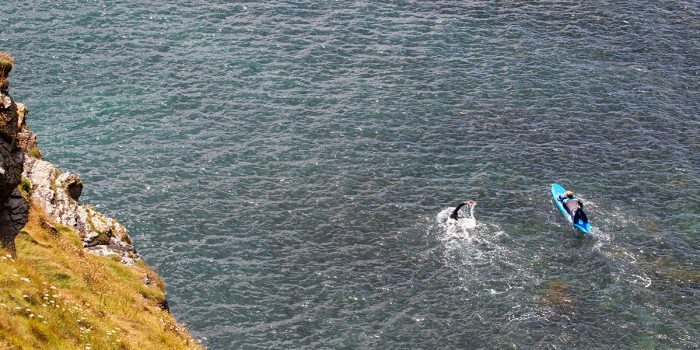 There are plenty of opportunities to spot wildlife from the vantage point of your paddleboard, from seals and jellyfish to a variety of seabirds. We use state of the art 10’8” inflatable SUPs from leading British brand RED, and they are incredibly stable and easy to use. Sessions last for around two and a half hours, two hours of which is spent on the water. Participants must be eight years old or over and competent swimmers (i.e. be able to swim 25M in a pool unaided), although we can accommodate younger children if accompanied by a parent and subject to conditions and availability. We ask that children under 14 years old are accompanied by an adult. We like to discuss your booking with you, so we can tailor it to your own needs. The team are a great bunch of guys and super knowledgeable guides, not just about the different activities, but also about the coastline and marine environment. 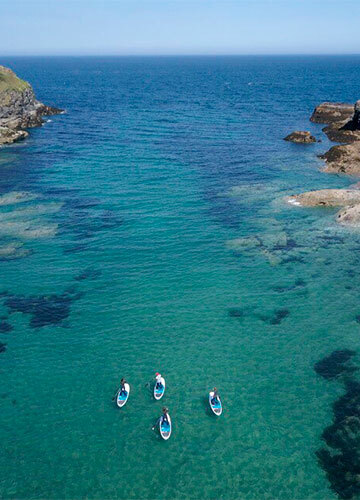 If you want to see the Cornish coastline from a completely different angle, and have an awesome time while doing it, give these guys a go! I’ve been going with these guys for years, very professional and highly recommended. Had a great afternoon paddle boarding. The briefing we were given was both helpful and friendly and gave us a clear guide as to how to make the most of our time. The equipment was excellent and the setting was perfect. All staff were friendly, helpful and really came across as knowing what they were doing and talking about. Many thanks for a great experience.